This document goes over recording basic videos and screencasts within Brightspace using the Insert Stuff button and Kaltura integration. If you are considering using this feature, please discuss it with your Instructional Designer beforehand. It is intended to be used for “Just in Time” content. This means for things that need to be made and placed in a course in an extremely short amount of time. This means it is not appropriate for everyday course development unless otherwise directed. Note: Using the webcam recording tool requires Flash to be installed. In addition, the Screen Recorder tool requires Java to be installed. Installing and properly configuring Flash or Java for your system is outside the scope of this help document. Should you have issues, it is recommended you contact your local IT support channels for help installing and updating Flash or Java. 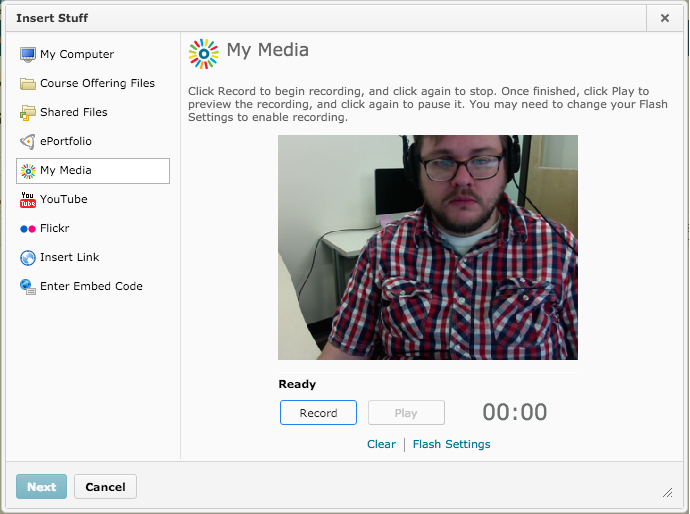 The Kaltura Brightspace integration allows you to record from your webcam directly in your web browser inside of Brightspace. Before recording your video, you’ll want to make sure that you are in a quiet area or room that has ample lighting. Please refer to our Video Basics documentation for general information about creating videos. Warning: To ensure your recording is of the highest quality, make sure you are on an internet connection with a fast upload speed. A slow upload speed may result in poor video quality. Using an on-campus wired connection will provide the best results. If you continue to have upload speed issues, contact your on-campus tech support. Navigate to the page/post you would like to place your recording in. This means the page or news item that your video will be viewed from. If this page or news item does not yet exist, you should create it now. Place your insertion point/cursor where you would like to insert your recording. Next, click the Insert Stuff button ( ) in the Brightspace Editor’s toolbar. This will open the Insert Stuff dialog. From the left sidebar of the Insert Stuff dialog, click My Media. Click the Add New menu and select Webcam Recording from the drop-down menu that appears. Now you will be presented with a dialog asking for permission to Access your Camera and Microphone. Click Allow. In addition, most web browsers will also ask for permission to access your Camera and Microphone. Should any other requests appear at this point, be sure to allow them access too. Now you should be able to see yourself in a small preview window. When ready, you can click the Record button to begin recording your video. Once you finish recording, click Stop. You can now preview your recording by clicking Play. Note that you may have to wait before your preview plays back. If you would like to re-record, you may click the Clear link located below the Play button. Doing so will delete your current recording, and prepare for starting a new one. Once you are satisfied with your recording, you can click Next located in the lower-left corner of the dialog. Title – This should be a short, but specific title/label for your video. Description – A longer description of the video, if needed. This is not displayed in Brightspace. SMGT115, HWM345, HIMT323, BPS983, etc. Once you have filled out the metadata, click Next in the lower-left corner of the dialog. At this point you will be presented with a final preview of your video. Click Insert in the lower-left corner of the dialog to place the video in the page/post. Note: Now that the video is inserted into the Brightspace Editor, it is treated just like any other letter, character or image. This means that an accidental press of the Delete key could delete it. See the section “Inserting a Previously Recorded Video” below if you accidentally delete a video. This section of the document covers recording a screencast with the Screen Recorder tool provided by the Kaltura Brightspace Insert Stuff integration. If this is your first time recording a screencast for us, please read the “Considerations and Setup” section of our main screencasting page. Before recording your screencast, you’ll want to make sure that you are in a quiet area or room. If you are also recording your webcam, make sure the room has ample lighting. Please refer to our Video Basics documentation for general information about creating videos. Click the Add New menu and select Screen Capture from the drop-down menu that appears. Now you will be presented with the steps required to launch the Screen Recorder tool. Once you are ready, click Launch the Screen Recorder to begin. You will now be asked for permission to run this Java application (the Screen Recorder tool). Should multiple permission requests appear, click Allow / Run on all of them. Now you should be presented with a floating interface similar to the one shown below. Now that the Screen Recorder tool is launched, we need to configure it, record the screencast, and upload the screencast. Then we will return to our web browser. 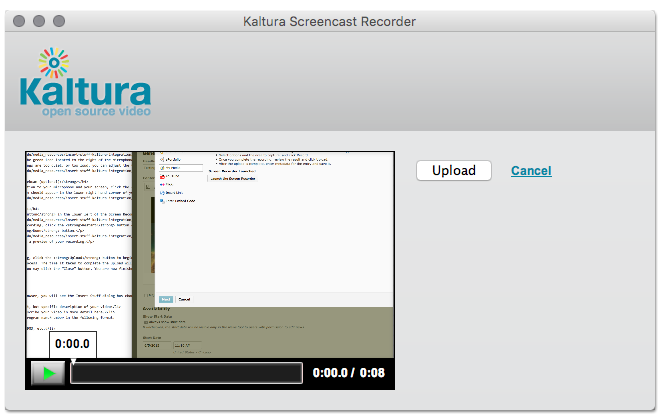 To reposition the recording region, drag the center box with the Kaltura logo in it. You can resize the recording area by dragging the corners of the selection area. We request that screencasts are recorded at a size of 1280px by 720px or below. This will help ensure your video is legible for students when they view it embedded in the course, and on mobile devices. This size is labeled Full HD in the size preset drop-down menu that is located at the bottom of the Screen Recorder tools interface. Do not record with the Recording Size set to Full Screen. Select Full HD and resize the windows you are recording to fit inside of the recording region as indicated by the dotted line. To include a recording of your microphone with your screencast, you must enable it for use by clicking the Microphone menu, and verifying that the microphone you would like to use is selected. Next, click the green icon located to the right of the microphone menu to test your microphone and make sure it is recording at a good input level. This is done by recording a test, and playing it back to see how it sounds. If things are too quiet, or too loud, you can adjust the volume slider here. Once you are happy with the test, click OK to proceed. To record your webcam, in addition to your microphone and your screen, click the Webcam menu in the lower-left interface of the Screen Recorder tool. Select your webcam from the list. Once it is selected, a preview of your webcam should appear in the lower-right corner of your screen. Your webcam will be recorded and packaged with your video, independent of where you place your screen selection area. Click the red Record button in the lower left of the Screen Recorder tool’s interface to begin your screencast recording. If you need to restart your recording, click the Restart button. You will now be presented with a preview of your recording. 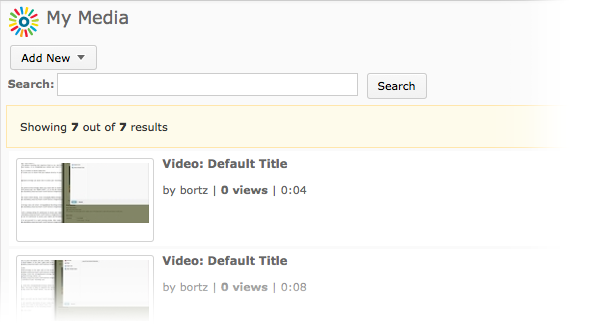 After previewing your recording, click the Upload button to begin uploading your screencast. This upload is a multi-step process. The time it takes to complete the upload will vary based on the length of your screencast, your network speeds and your computer speed. Once the upload is complete, you may click the Close button. You are now finished with the Screen Recorder tool. Note: Now that the video is inserted into the Brightspace Editor, it is treated just like any other letter, character or image. This means that an accidental press of the Delete key could delete it. See the section “Reinserting a Previously Recorded Video” below if you accidentally delete a video. Navigate to the page/post you would like to place your previously recorded video in. This means the page or news item that your video will be viewed from. If this page or news item does not yet exist, you should create it now. In the main area of the dialog, you should see the Add New menu, along with a list of previously uploaded videos underneath. Note: The videos shown here will only be ones that were uploaded with the currently logged in Brightspace account via this Insert Stuff method. Browse the list until you locate the video you would like to insert. Then select it by clicking the videos entry in the list. This will give the video a blue highlight indicating it’s selected. Click Next in the lower-left corner of the dialog. You will be presented with a preview of the video. From here you can insert the video by clicking Insert in the lower-left corner of the dialog. You can also navigate back to the list of videos. Published on December 07, 2015 at 12:29:42 pm CDT. Last modified on May 08, 2018 at 12:42:45 pm CDT.